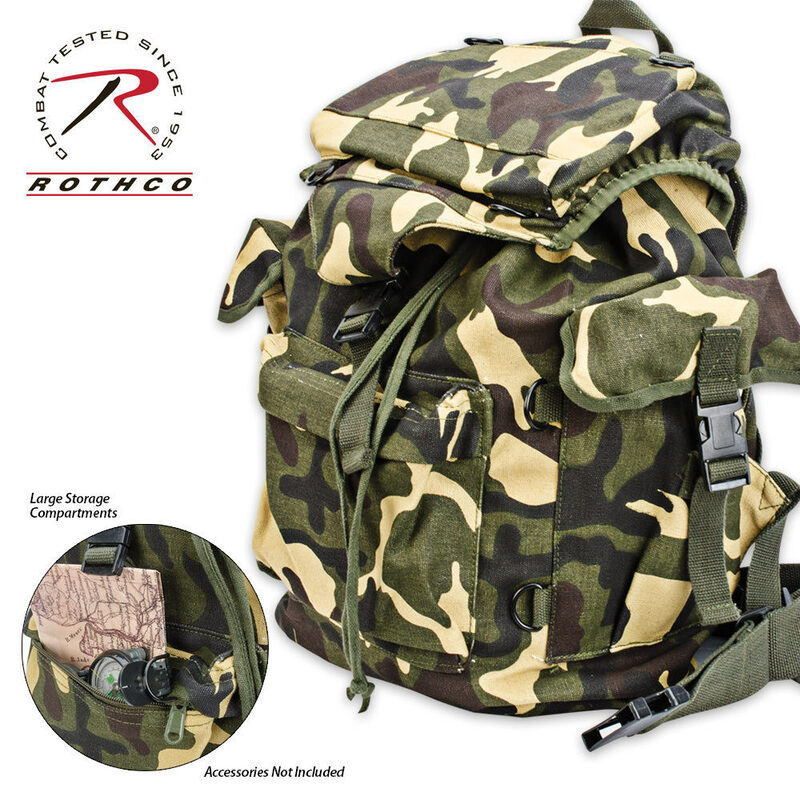 ROTHCO Woodland Camo Rucksack Pack | BUDK.com - Knives & Swords At The Lowest Prices! 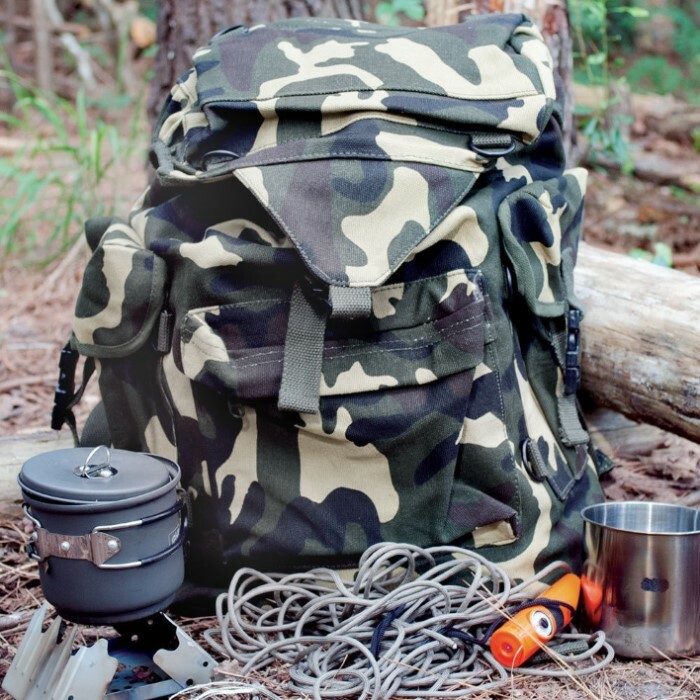 Ideal for campers, hunters, hikers, and all other outdoorsmen. 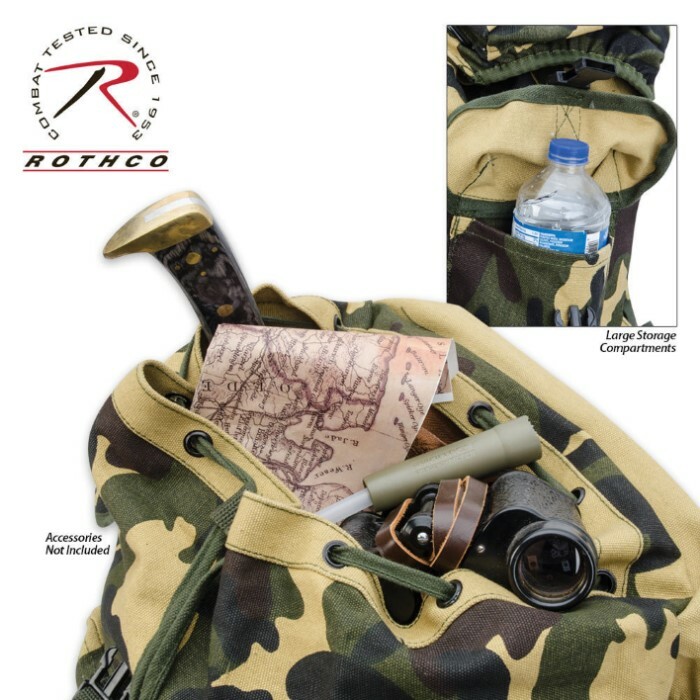 Measures approximately 19" x 13" x 8"
Every outdoorsman needs a good, quality rucksack for his adventures, and this Outdoorsman Rucksack is the ticket! I had this bag for 2 years it rode on my harley with me for that whole time without any problem. Unfortunately on a recent trip to san fran the car I was in was broken into and my bag was stolen. I am hoping for a new one soon if it only came in black. This is a moderately sized dump bag with nice latching pockets and some useful D-Rings. A pretty good bag to load up with stuff that will sit around waiting for the bell. If you think these are MIL spec built you'd be wrong. The sewing/threading is marginal and the two I received have straps that appear to be pulling apart with little effort. Definitely not for everyday use. Probably fine for very occasional use. A fix for this would be to have someone redo/reinforce the strap threads. Lastly, when the pockets are loaded the flap covers fit loosely even with the straps cinched all the way. It's a bit sloppy. Not a deal breaker for me considering the low price however. A good basic rucksack, made of heavy material. The main compartment is drawstring closed, so no load on on a zipper which is the usual failure mode. The smaller compartments are well located, with some closed by snap buckles, which I prefer. Very basic rucksack.Ok quality,better then some of the other imports,pack would be ok for a weekend camping trip. I bought one for my son. When it got here I liked it so much I ordered me one. Very Impressed. Well I must say the quality of this pack surprised me. I would definitely recommend this backpack to anyone looking for a good deal. I am very pleased! I bought this for a reserve bug out. When it arrived I was very surprised at the overall ruggedness and strength of the pack. It was also bigger than I had expected (because of the low price). I immediately ordered two more and they are equally well made. These aren't "high end" backpacks but, they are real good at the price. I ordered this bag because it was the cheapest one, I was impressed it, its very sturdy, huge, comes with a belt strap, was worth every cent. I ordered this pack because it was a good price. I didn't know what to expect. It is a real nice pack. It is fairly rugged. It is also bigger then it looks. The waist belt is a huge plus. I am a big guy and it fit me. I would recommend this to anyone.